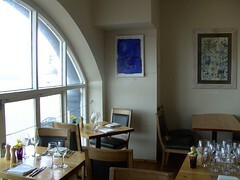 I have been invited to hang some of my pictures in this gorgeous restaurant right on the beach in Brighton. Trouble is, the view is so endlessly interesting that I’m not sure anyone would want to look at anything else. Due South prides itself on its sustainability as well as its utterly delicious food, so it feels a doubly appropriate location for me. Though I don’t suppose for a moment they use recycled materials – at least in the dishes. Since childhood I’ve been obsessed with food and cooking, and drive my family mad by wanting to photograph our meals when we’re about to eat. Time I started work on some long-planned ‘food’ pictures. The two pieces you can see here are not remotely food-related: An Habitation of Dragons, with its intense blue washes of cobalt, and my homage to Charles Darwin, ‘I Think’ – Darwin’s Tree. This entry was posted in All on August 26, 2008 by Jill. The Lincolnshire artists’ Open Studios scheme, Art on the Map, has undergone a transformation this year. 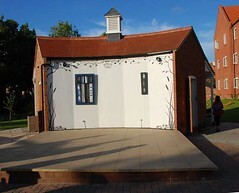 It’s been triumphantly adapting to funding problems by raising its game, staging a series of exhibitions and events all over the county – Louth, Fotherby, Lincoln, Hackthorn, Grantham….lots in the pipeline. All this in addition to the usual Open Studios which are now being organised in cluster groups, to allow more people to visit more studios – and artists to visit each other. The new, beautifully produced brochure will be out any minute! Look out for it in the usual places, including libraries and tourist offices. There will be autumn, Christmas and spring events. This entry was posted in All on August 22, 2008 by Jill.